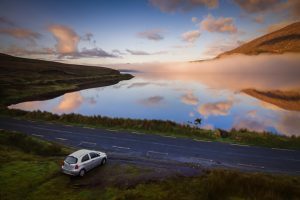 A new electric vehicle (EV) share model may change the way people use car-share, at least in Ireland. The twist? Park the car anywhere you want when you’re finished with it. Danish company Green Mobility operates its sharing service in operational zones, which are often defined as specific city limits. Unlike traditional car-share models that mandate specific pick-up and drop-off locations, Green Mobility users can park their cars in any legal space within that limit. The next user locates the nearest car with an app, which also unlocks and later locks the vehicle. Cars that drop below 10 percent of charge are automatically dropped from the app, and a mobile team takes care of charging, cleaning, and maintenance of the company’s fleet. Green Mobility’s first Irish fleet consists of 400 cars deployed in Dublin. Read more about it here.